I bought this book shortly after it was published and read the first 50 or so pages. After that, I became distracted by other deadlines and life events. I always promised myself I would come back and read it (along with many of Peterson’s other works) when I took my next call as a pastor. Peterson died recently. A number of Christian publications published wonderful eulogies and many of my friends contributed their own reflections on social media and in person. Peterson certainly was someone I esteemed; however, it would be dishonest of me to claim him as an influence. I met him twice, heard him speak or preach about a half dozen times, count among my friends and mentors people who were friends with or mentored by him, etc. I found him to be a thoughtful person and an engaging writer; but, much like his memoir, most of his work slipped down my reading list over the years, constantly replaced by books that seemed more pressing regarding my own research. The only things I can honestly say I read were his Message Bible and his pastoral book Working the Angles, which an undergraduate professor assigned in a youth ministry course I took in 2000 or 2001. Thus, it finally seemed time to pick The Pastor back up and try again, if for no other reason, to know something of the man that so many people I love and esteem considered such an important writer, thinker, and mentor in ministry. 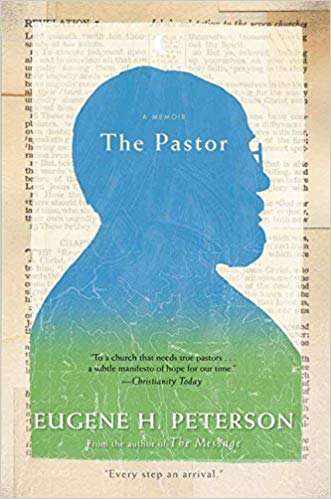 Eugene Peterson developed his vision for what the church is and what a pastor should be in contrast to the growing tendencies of American Christianity to treat the church like a business and the pastor like a CEO. A few particular things in Peterson’s memoir really flesh this vision out. First, he emphasizes his idea of a “biblical imagination.” This is Peterson’s penchant for thinking about his contemporary context through the lens of scripture. He talks about his 1960s church plant as the early church “Church of the Catacombs”, and compares his time learning to be a pastor to David’s time in Philistine with a rag-tag bunch of Israelites. He spent his early years as a pastor preaching through the book of Acts. This, more than anything, gives us a sense of how he read scripture and pastored. He didn’t think the book of acts was an “instruction manual” to be be followed or a “blueprint” for franchising the church in new locations; but, he thought the book of Acts was a story about how God’s church learned to be God’s church in the 1st century and it (1) makes us aware of the fact that we are a continuation of that story today, and (2) that the church learns to be the church today by paying attention to the stories of what God is doing in its midst and thinking of its own life in narrative terms. The church is a community that is gathered around the story and stories of who God is, what he has done, and what he is doing. Whenever the church seizes hold of a “method” or an “action plan” to build an effective church or to be successful, it compromises the central Christian claim that God is still acting and that the story is still going. The church is God’s people in a particular place in time. The church is not a chain restaurant that you can franchise, simply reproducing the same material conditions in each new place as a guarantor of success. To do this is to ignore the people to which the gospel speaks. Some forms of denominationalism and post-denominational evangelicalism tend to look more like business franchises than churches and we should be deeply suspicious of this. Peterson’s “biblical imagination” is not unlike Hans Frei’s idea of the “text absorbing the world.” That is to say that it seems to function in a manner where the biblical narrative becomes the means by which Peterson learns to “re-narrate” the world around him in a manner that allows him to see what God is doing and how the church is called to be a part of it. Review: Must-read for pastors and lay leaders. Deeply edifying reading for all Christians.